Summer days don’t get much better than this. You’re on Kolovrat, a terrace that overlooks flower, herb, and vegetable gardens. A creek full of wild trout flows through the property. A picturesque town, which has overcome far too many tragedies, is nearby. The rocky Julian Alps, named after Julius Caesar, surround you. While, if you look closely, you can see the Adriatic Sea, Trieste, Croatia, and even Venice in the distance. 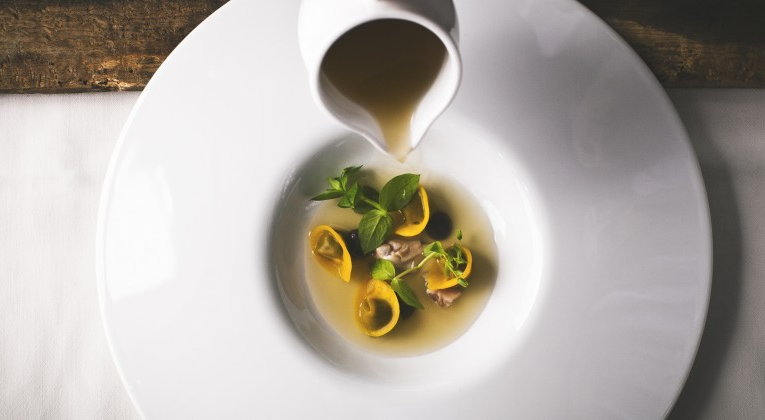 Now all you need to add is wine—biodynamic, of course—and an 11-course dinner to complete the day. This perfect setting is courtesy of Hiša Franko. The estate has been a roadside inn, a mill, and a World War II hospital, since it was built in 1868. Ernest Hemingway even supposedly wrote A Farewell to Arms, about the Battle of Caporetto, here. After the war, the area became part of expanding Yugoslavia and the estate was turned into a restaurant. Slovenia eventually split from Yugoslavia, but Frank’s House remained in the family. It wasn’t a son who took over the restaurant, though. Valter Kramer is actually the sommelier. It’s Ana Roš, his wife, who helms the kitchen. She should have been a diplomat. Or maybe an Olympic skier. Instead, she taught herself how to cook. She’s now considered one of the best chefs in the country and one of the best female chefs in the world. It’s because of her that so many people, including yourself, are now planning their first trip to Slovenia. Your trip began in Italy. Slovenia, a landlocked country save for less than 30 miles along the Adriatic Sea, is surrounded by Italy, Austria, Hungary, and Croatia. 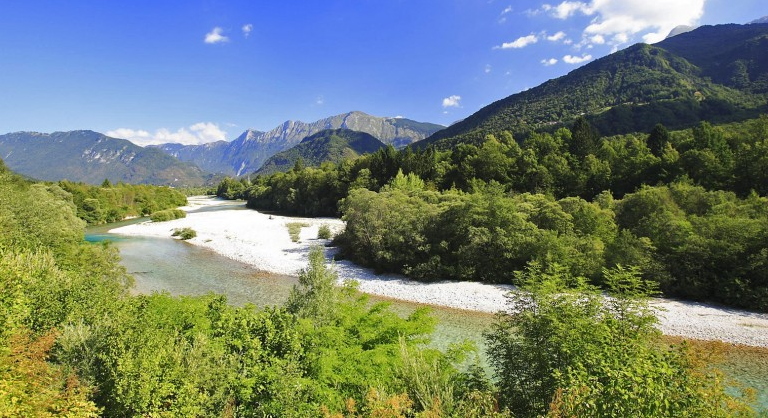 When you reached the Soča Valley, you found the turquoise Nadiža River, tropical forests, and bright green pastures. Kobarid, one of the westernmost towns in Slovenia, is just two miles from the Italian border and 20 from the Austrian. It’s home to the Church of St. George, an award-winning anti-war museum, and a mass gravesite from World War II. But the pretty town is not stuck in the past. It’s surrounded by too much beauty. So you were enchanted long before you reached Hiša Franko. Then you found the pale pink building, where three generations of the Kramer family live. A large husky came running out to greet your car. He acted as a tour guide as you passed the piano and the modern art en route to your room. There are 13 modern rooms here. Some feature massage bathtubs. Others offer spacious terraces. They all allow diners to enjoy the evening without having to drive down the windy roads after dinner. And what a meal it should be. A sneak peek at the menu reveals fried dandelions and cheese lollipops as little snacks. Grayling, sardines, and dirty cuttlefish start the meal on light notes. They’re followed by bone marrow ravioli that is promised to melt in your mouth. Beef tongue and wild duck, Soča trout and mountain rabbit come after that. The cheese, which is taken just as seriously as the wine, comes from the temperature- and humidity-controlled cheese cellar. Forest honey liberally drenches the desserts. While even the colorful tea, made with local herbs and flowers, smells like Slovenia. This is sure to be not only your best meal of the summer, but probably the entire year.